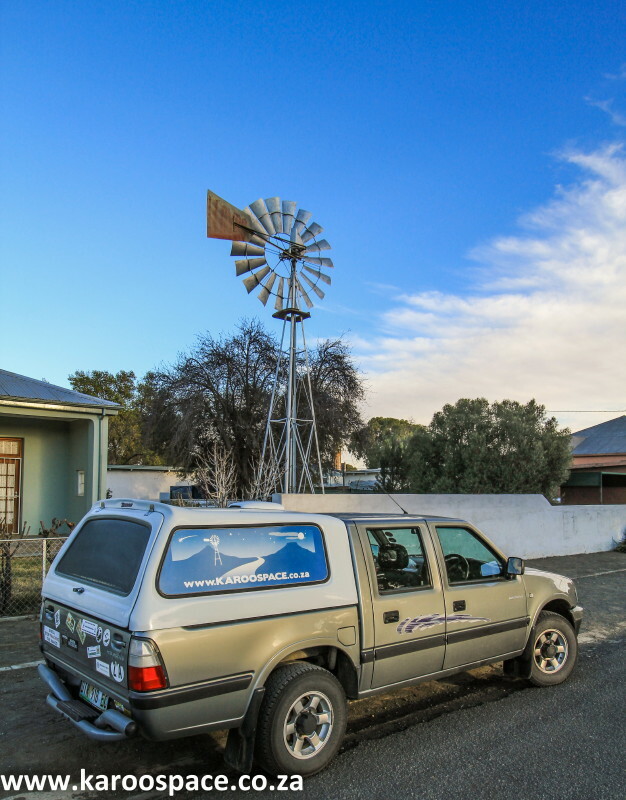 The Karoo Space bakkie in the country – people often think we’re an alien recovery team. 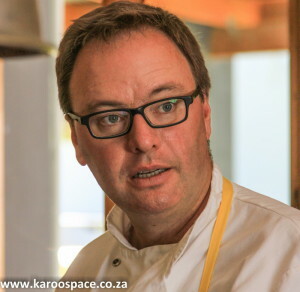 Gordon Wright – Chef Supremo of Graaff-Reinet. To that one, we’d love to say yes. We’re an alien recovery team and we’ve come to pick up survivors from the UFO that landed outside your town last night. That’s right. We’ve all heard about the Tall Poppy Syndrome. In different countries, it means different things. Well, here in the Karoo we love our tall poppies. They make the world a brighter place, they give the kids hope and they make the shepherds sing with delight. And because the power of networking is so strong in the Karoo, it’s a pleasure to slip their stories into the communication system of the Heartland. People need to network across this vast space to survive. 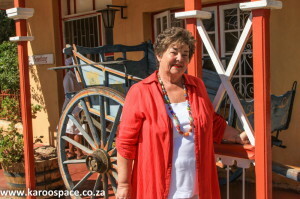 Sandra Antrobus – visionary owner of Die Tuishuise & Victoria Manor in Cradock. 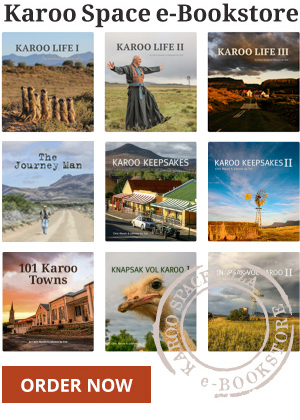 Our job here at Karoo Space is to move around the 101 towns, villages and little settlements of the heartland, their farms and their communities, looking for poppies to write about. And even if they’re short poppies, no matter. We’ll help them grow by exposing them to people who read our books and magazine articles. And when a light shines on you, who knows what good things can happen? The Graaff-Reinet chef who writes his own books, hunts his own protein and has taught his ten-year-old son to cook, who connects small local food suppliers with wider markets at every turn, he’s a Karoo tall poppy. The Cradock hotelier who saw a derelict street and built it up into 30 fabulous guest cottages with a Victorian-era hotel on the corner, she’s a Karoo tall poppy. Antoinette Pienaar and Johannes Willemse – herbalist healers. Her daughter has brought her amazing networking skills to town and can organise a pop-up festival – even from a long distance away. She and a duo from nearby Bedford, a journalist and local estate agent who have combined to raise the village profile to stellar heights, they’re true Karoo tall poppies. Antony and Margie Osler of Poplar Grove Farm, outside Colesburg. 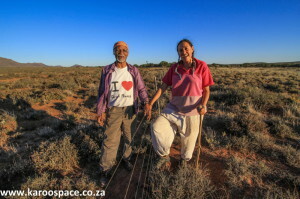 The Beaufort West herbalist and her jackal hunter mentor who have turned their backs on the material world and heal people from near and far, they are Karoo tall poppies. The Jagersfontein artist who has spent more than a decade teaching local crafters how to make world-class French wire keepsakes for the travelling market, she’s a Karoo tall poppy. The team of dedicated Colesberg women who run an incredible school for farmworkers’ childen and an outreach programme for pregnant mothers, they’re all Karoo tall poppies. And what’s more, they’re running a Karoo tall poppy factory out there. 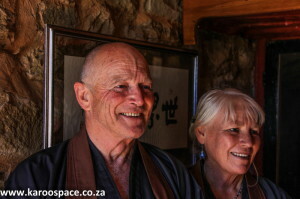 The Zen Buddhist writer, lawyer and singer and his teaching, farming wife who live their lives with love and lots of thought, making a retreat for those who seek peace, they are Karoo tall poppies. Auntie Evelyne Olifant, who runs a restaurant in Nieu-Bethesda. 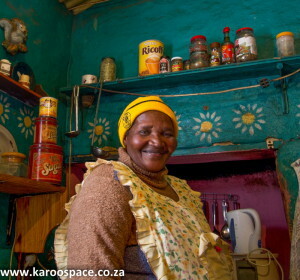 The Karoo cook who runs an eatery in Nieu Bethesda’s township and who feeds hungry children from the soup kitchen next door, she’s a Karoo tall poppy. We could go on. And we often do. Because we’re finding plenty of Karoo tall poppies as we go from town to town, face to face. And because we write books about these people, they are firmly fixed in the narrative of the Karoo. Their stories will remain long after we’ve gone off to the Great Newsroom in the Sky. Chris and Jules you are our uber tall poppys. We wonder how and why we ever got so lucky to have you in our Karoo lives. We thank our lucky stars. You deserve love and kindness and reward around every corner. Mom and dad are with us, i just read them your story and they just said “Wow”. We love you so much and we miss you terribly. Single male, looking for accomodation for a couple of months, not seeking B&B’s but getting a feel for the day to day life of the Karoo. I am 61, healthy, primary school TVL. high school Cape Town. I now live in Maine, USA. 20 yrs. retail exp., B.A. Geography/Anthropology. My preference would be to be a part of the day to day life of the community, working the fields or helping behind the counter. Afrikaans ‘n bietjie rof… I enjoy photography, take part in sprint triathlons, stand up paddle boarding, when knees allow, love the outdoors. I do not mind sleeping in my tent, providing I have access to a shower and toilet. Eating arrangements would love to sit around the table. Obviously not looking for a free ride and could if required get you character references. I simply love the way you think, see and write! The Karoo owes you guys big time. Cheers to you both for highlighting the real people in life who really stop to smell the roses and enjoy every step along the way too. Thank you seems like such a small word right now, so for what it is worth, THANK YOU ten fold for these amazing stories, fabulous photography and most of all heart and soul lessons life is teaching through you! Thank you! Brought tears to our eyes. Why not try Nieu Bethesda, there is a camping ground with ablutions, a pub you could try and get a job in, mountain’s to climb, farms to visit, tennis to play, books to read, fossils to find, night skies to photograph, roads to run, karoo lamb to eat and lots of wonderful people to meet. Leave a Reply to Jacquie Click here to cancel reply.